With the ever changing world and pollution increasing day by day the need of the hour is a proper collective approach to minimize our dependency on the fossil fuels to generate electricity thus comes rooftop solar system into the picture so as to reduce our carbon footprints and reduce the release of harmful gasses into the atmosphere which is damaging our ozone layer. One of the collective approach in this area could be that each house and buildings whether residential or commercial take an initiative to install rooftop solar system so as to generate electricity for own consumption or to feed back to the grid and take advantage of the various schemes and benefits offered by the government. So why Rooftop Solar System? 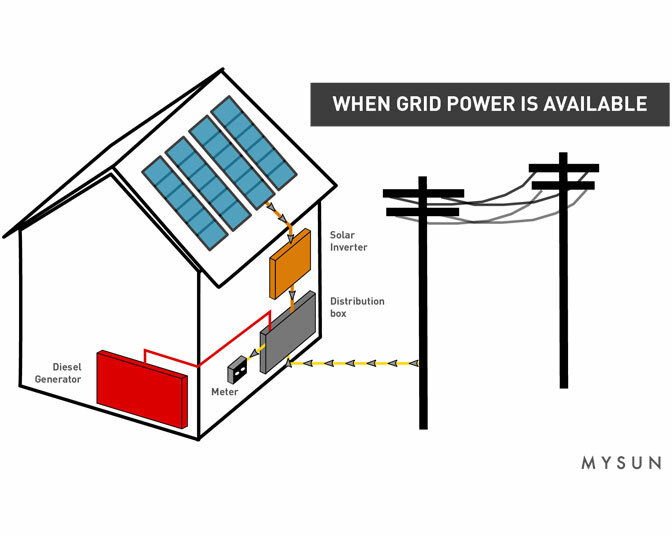 In grid connected rooftop, the power generated from the solar panel is DC which is then converted into AC through power conditioning unit and is then wither used for our consumption or fed to the grid of either 33kV/11kV or of 440V/220V depending upon the location of building and the legal requirements which govern that area. Systems of this kind generate power during the day which is used by the captive loads inside the building while the excess power is fed back to the grid. Also in a scenario when the power generated by the solar system is not sufficient enough then the loads are served by drawing power from the grid. What are the benefits of Rooftop Solar System? We can achieve energy as well as ecological security by reduction of carbon footprints. Additional benefit could be better management of peak loads especially during day time by the utility. Its interesting to note since the power consumption and generation is co-located there would be minimum technical losses. 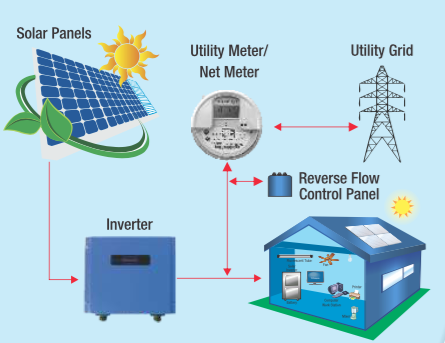 What are the types of metering arrangement in a rooftop solar system? It is important to note that the way electricity is billed strongly influences the profitability of a solar rooftop system. 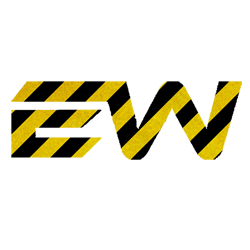 Therefore, it is highly recommended that the final user makes the most of the metering system to take advantage of the investment made. This kind of metering us generally preferred by rooftop owners or third party investors who will like to sell all the energy produced to the utility by either using their own roof or of another party. This is also known as feed in metering where the full power generated by the system is exported to the grid and is separately recorded through a ‘feed-in-meter’. By doing so investors enter into a Power Purchase Agreement (PPA) with the utility. It is interesting to note that only grid-connected PV systems can be gross-metered. This is one of the most common type of business model adopted by most of the end users. In this model the consumers purchases the solar system, by making 100% of the payment upfront. In this kind of arrangement a RESCO developer finances, installs, operates and maintains the plant. In this case the RESCO signs an agreement with the rooftop owner and the rooftop owner can consume the electricity produced as per the decided rate with the RESCO on a monthly basis till the tenure of the agreement. Now let’s talk about the latest development in the rooftop solar system : Tesla’s innovative solar rooftop solution ! So the first announcement made about the tesla solar rooftop tiles was back in October 2016 and have after a wait for almost 18 months they are finally here in the consumer market along with its other products like the electric cars Tesla is has home battery also known as Powerwall. So what inspired Tesla to come up with a rooftop solar system idea? 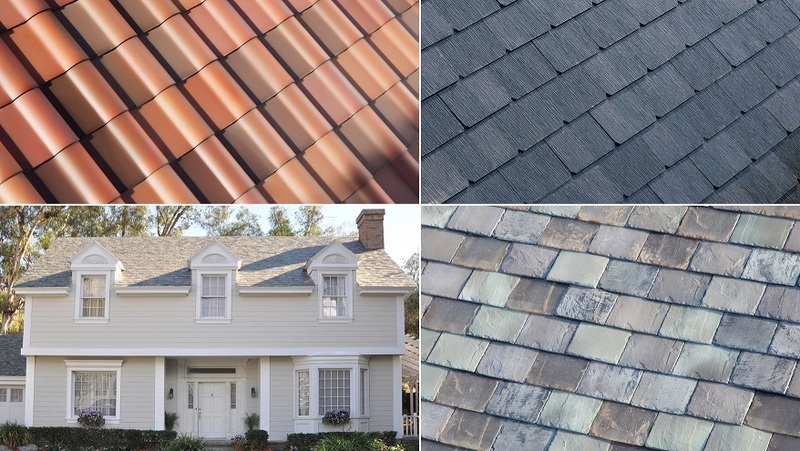 It is interesting to note that the technology for solar roof tiles also called as solar shingles came out in 1970s itself. Several companies have tried their best to make a solar medium that will look and at the same time like a traditional roof over the house. While building this solar rooftop system Tesla didn’t invent anything new but their products have taken the aesthetics to a whole new level just how they have done with their electric cars. Price comparison: Is it worth it? It is undoubtedly a premium product of Tesla which is constructed with thin layers of quartz and are impossible to break. 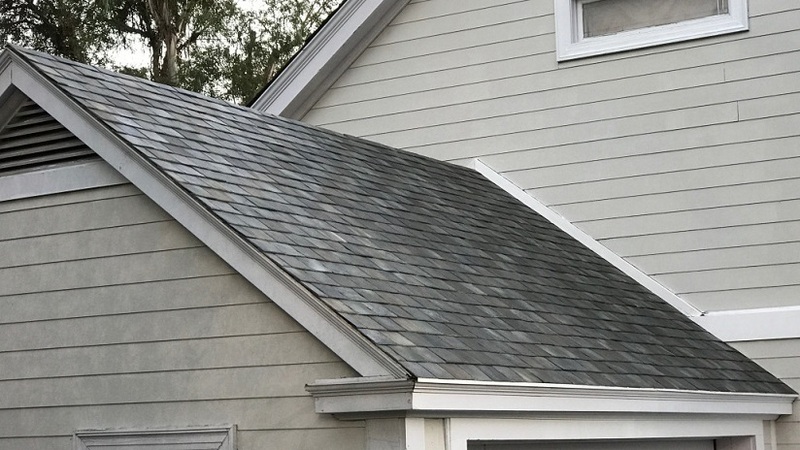 While the cost of installation of this tiles may vary depending on the location and other factors, Tesla confirms that their solar rooftop tiles will sell around for a price of $21.85 per square foot which as compared to regular roofing is obviously very high since costs only $1-2 per square foot. So a house with rooftop area of let say 2500 square foot will cost somewhere around $54,000. 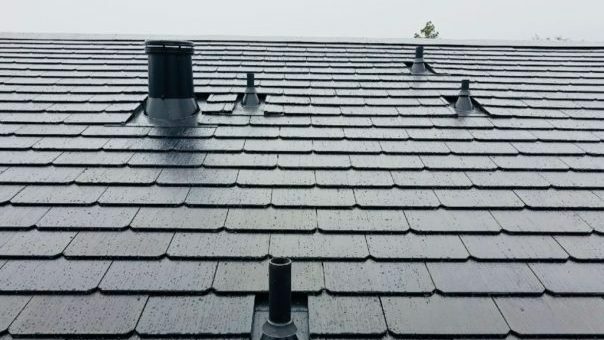 This huge upfront cost is one of the reason why installations have been slow on the other hand Tesla claims that the solar rooftop tiles will last a lifetime whereas the traditional asphalt shingles will last only 10-20 years. How is Tesla solar panel roof different? They are very different from our traditional solar panels because every tile contains a solar cell which means they not only look like, function as a traditional rooftop tiles but also produce electricity! It is unique because it doesn’t look like your traditional solar panel installation. Every solar cell is invisibly embedded in to each tile, these tiles when installed together like how we do it for a traditional roof not only produces electricity but also acts like a roof. At the same time, it is their unique technology which they used which helps it to collect almost 98% of the solar energy as compared to the traditional solar panel. The unique type of louvered glass tile works more or less like the same way as window blinds which reflects sunlight to appear opaque while still absorbing the rays if the sun. The electricity produced can then be used to power your home and maybe to charge up your Powerwall battery if you choose to solar energy for later use. 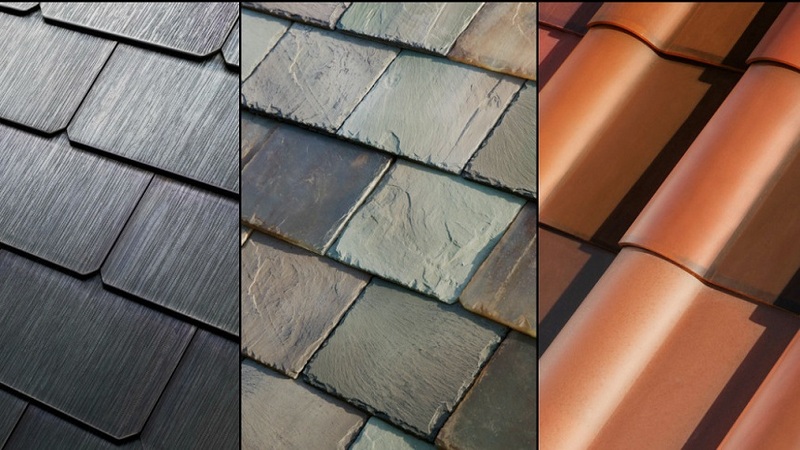 What are the advantages of Tesla solar roof tiles? Aesthetically, the Tesla solar tiles out shines the traditional solar arrays since they are no bulky frames, visible wiring and junction boxes. The tiles look like any other roof tiles which helps to significantly increase your home value. Since the design of the tiles are almost indestructible, Tesla offers to replace their tiles without any questions asked as long as you own the home and without any time limits.